ThalesRaytheonSystems has been awarded a $21.8 million contract by the U.S. Army to upgrade multiple AN/MPQ-64 Sentinel air defense radar systems. This award is an option to the existing upgrade contract originally awarded in June 2007. The contract will upgrade the U.S. Army Sentinel radar transmitters, receivers and exciters and increase functional capabilities such as faster data processing and greater detection range for smaller targets. Additional capabilities will also help minimize instances of fratricide and accidental counter-missile firing and facilitate a transition to defense-force mobility. Upgrade work will be performed in El Paso, Texas, and Fullerton, Calif. The Sentinel radar is the premier air surveillance and target acquisition and tracking sensor for the U.S. Army’s Cruise Missile Defense Systems program. The radar’s primary mission is to protect maneuver forces and critical assets from cruise missile, unmanned aerial vehicles, and rotary- and fixed-wing threats. The Sentinel accurately acquires targets far enough forward of friendly troops to provide sufficient reaction time for air defense weapons to engage at optimum ranges. More than 200 Sentinel radars are currently deployed by military forces worldwide. The AN/MPQ-64 Sentinel is a three-dimensional radar used to alert and queue Short Range Air Defense (SHORAD) weapons to the locations of hostile targets approaching their front line forces. 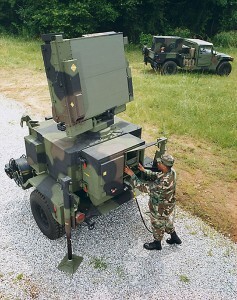 The Sentinel radar is deployed with forward area air defense units of the U.S. Army and USMC. The radar uses an X-band range-gated, pulse-doppler system. The antenna uses phase-frequency electronic scanning technology, forming sharp 3D pencil beams covering large surveillance and track volume. The radar automatically acquires, tracks, classifies, identifies and reports targets, including cruise missiles, unmanned aerial vehicles, rotary and fixed-wing aircraft. It uses a high scan rate (30 RPM) and operates at a range of 40 km. The radar is designed with high resistance to electronic countermeasures (ECM). Mounted on a towed platform, it can be positioned remotely from the rest of the unit, operated autonomously and communicate with the Fire Distribution Center (FDC) via wideband fiber-optic link. It can also distribute its data over a SINCGARS radio network.